It has been too cold and wet to enjoy the garden much recently and I have postponed much-needed weeding and other chores. Browsing around the borders on Friday I noticed 5 or 6 stems of lavender hyacinths had all flopped down toward the ground. Whether something was eating the roots or recent cold temperatures had caused the collapse I could not determine. Other colors nearby seemed fine. So it remains a mystery, but I rescued them for today’s vase. They seem to be taking in water and continue to look fresh. The pale yellow hyacinth continues to be a favorite, but it is joined this week by a more buttery yellow that is quite nice. Bursting with flowers, bridal wreath spiraea was used to achieve height and textural relief. A small patch of Leucojum has been blooming recently. These are pass-alongs from my sisters’ garden. I gathered a few and tucked them into the vase for a little surprise when viewing at close range. Many readers were interested to know how long last week’s submerged flowers would last. I had prepared the vases on Sunday mid-day. The anemone began fading after a day and a half, but kept intact. After another half-day (Tuesday morning), it was done and the water was colored purple. The hyacinth lasted until Wednesday. 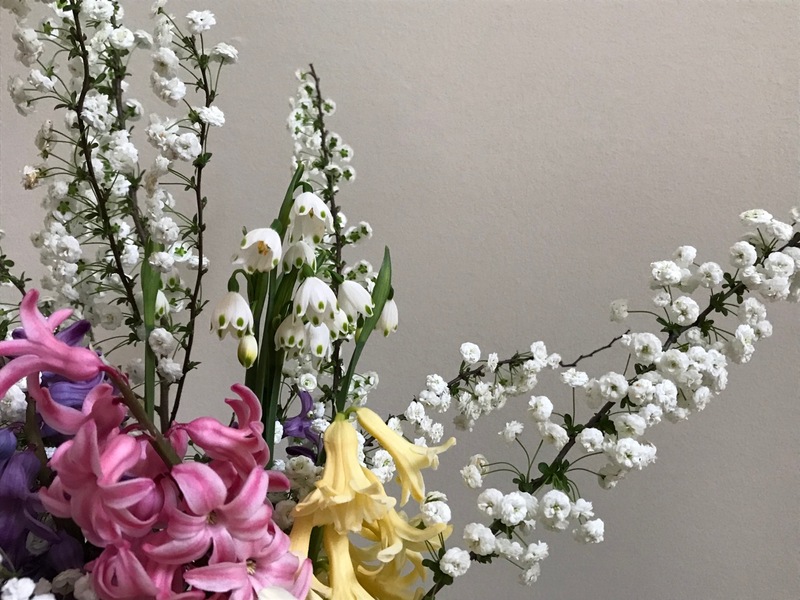 This entry was posted in garden and tagged 2018vase, flower arranging, flower design, Hyacinth orientalis, in a vase on monday, Leucojum (snowflake), nature photography, Spiraea prunifolia (bridal wreath spiraea) on March 12, 2018 by pbmgarden. All your Hyacinths look lovely but like you I think the creamy white one looks very special. Your Spiraea is ahead of mine; I can’t wait to be able to use it in a vase too, it’s lovely and airy. The spiraea has been a bright spot in the garden the past week. Weather has been terrible but I’ve enjoyed looking out at the shrub encases in white blooms. I checked mine again when I went back outside and there are a few buds open now so it wasn’t far behind yours after all. We had two days when it was so warm we had lunch outside. But this week it is very cold and very wet again. I mustn’t complain about the wet but I can do without the hailstones we had today!!! Your spring frills are wonderful! Is the spirea out in your garden? I thought of cutting off the stems of my floppy hyacinths and now I have seen yours I will do that. Yes the spiraea is one I’ve had many years. 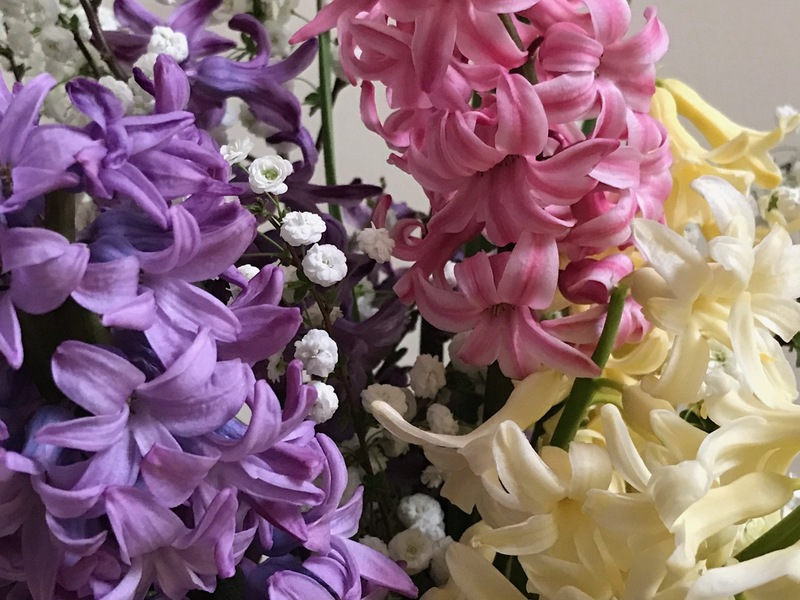 What makes the hyacinths flop? Not sure – just a bit past it? I used to prop them up with wooden barbecue skewers but have run out. I’ll bet those hyacinths smell great. The bridal wreath is a good addition, mine are a little sad. 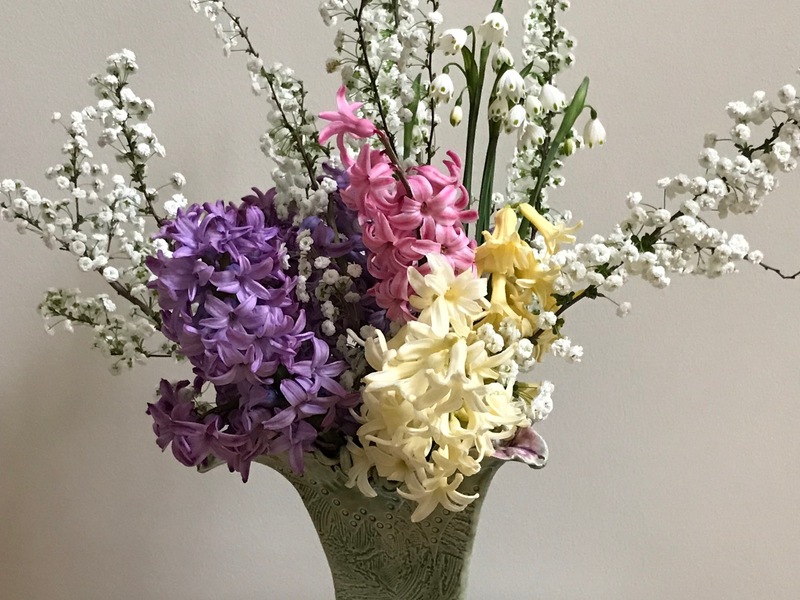 Hyacinths were a bit overwhelming in this quantity so I moved them to a place I could admire them from afar and catch a an occasional whiff. 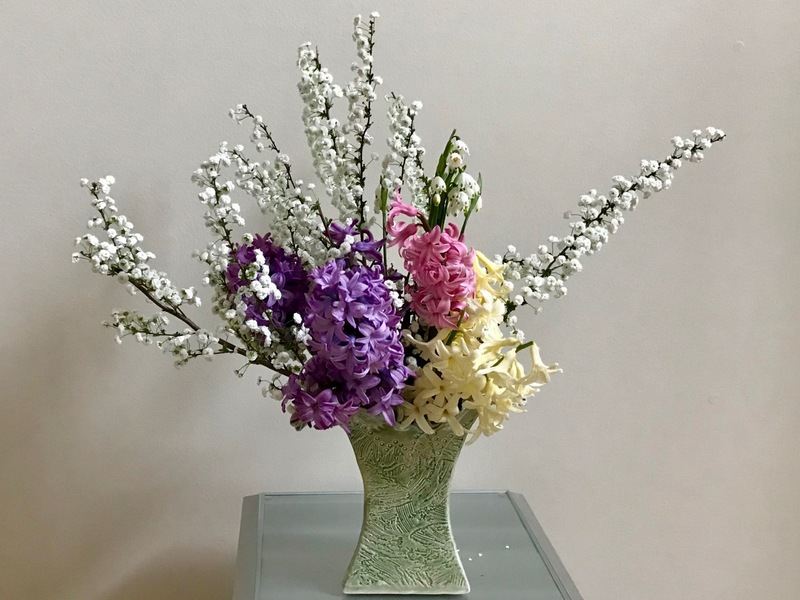 Oh Susie this spring vase is what makes my heart sing…hyacinths are my favorite and these are stunning with the white blooms in that lovely vase. I love the frilliness of the vase, and thanks for the update on the submerged flowers. The 3rd winter storm is coming and we are staying in winter through March so I needed a shot of spring. Donna, your area has had more than its fair share of winter storms. Keep safe and think warm thoughts. These are so pretty, a delight. I must look out for a spirea. I know the flowering is short but they are so lovely while they do flower. I love these colours. Thanks. Hope you find a spiraea to enjoy. Mine reminds me of a special relative. I love the way the shape of the vase makes the flowers seem to burst forth with the excitement of spring. As usual, extremely well done! Thanks Peter. 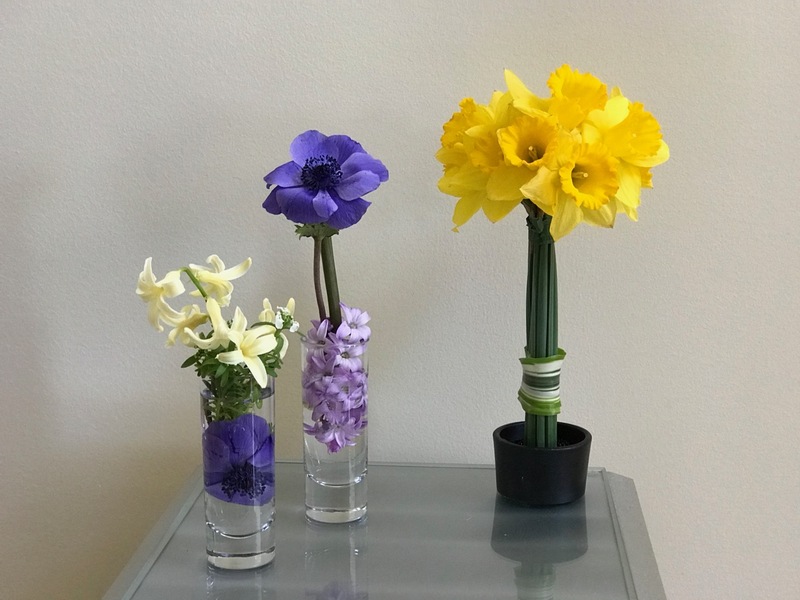 The vase shape make the flowers easy to assemble. 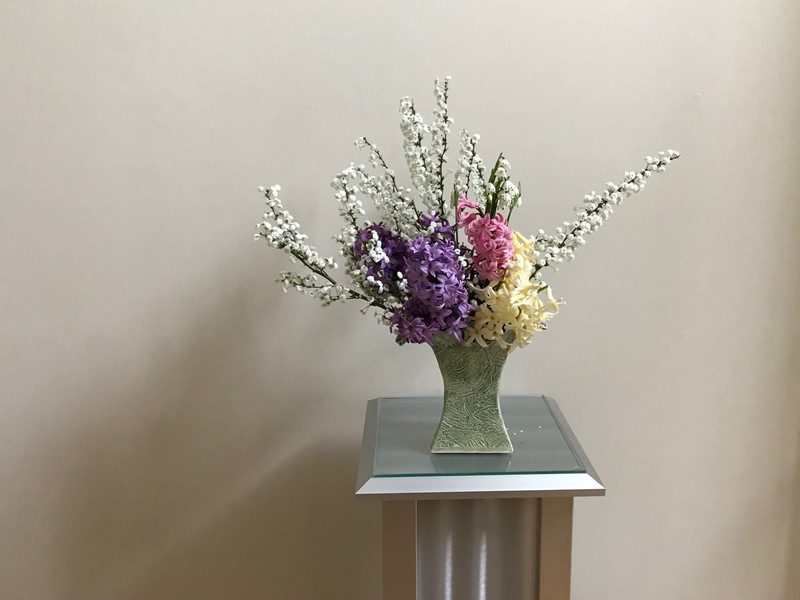 I love the way the Spirea lightens up the vase and opens the arrangement outwards. I would not have recognized if you had not said what it was. Thanks. Originally I used only the hyacinths but the extra stems of spiraea helped give it presence. Thanks Cathy. I usually discard spiraea after a couple days. It will last a long while but I don’t want to forget about it and have to pick up those white flowers everywhere. Delightful, as always, Susie. My leucojum haven’t started to bloom yet. Thanks John. Your leucojum must have read the weather reports and chose to tuck in. I love the yellow hyacinths too! I can almost smell them! 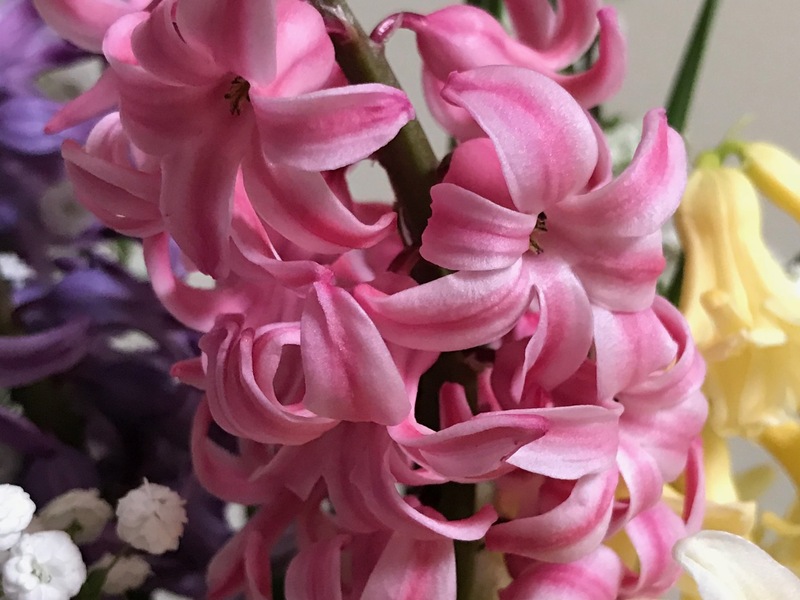 I love looking at hyacinths close up. Thanks Ali. The details on the hyacinths are amazing. 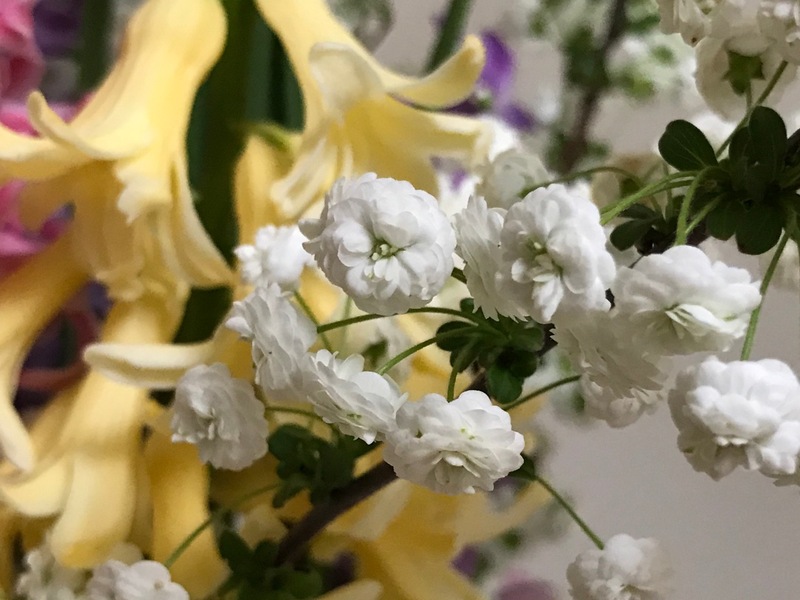 A pretty arrangement in shades of sugared almonds..as for that Spirea: just how many of us will be on the look out for that? Yum, those almonds sound good right now don’t they? I’ve had the spiraea many years, brought here from my last garden. It’s drooping this afternoon in a snow storm, so glad I brought some stems indoors. Cathy was just talking about that sort of backdrop and vase. As much as I dig hyacinth, I really dig the spirea. It is like baby’s breath on a stick. The spirea is always a charmer this time of year. It spreads by the roots though so I have to keep forcing it back into its designated spot. They are rare here, so I tend to notice them, and I really do like them. As the snow falls this afternoon, I am calm, even knowing my hydrangeas probably are ruined once again for this season. I love the daylight savings time, keeping more daylight suits me well. Here’s to spring Annette. That’s why I stopped planting H. macrophylla in my Swiss garden but thankfully there are others which don’t fear the cold. The paniculatas are gorgeous too. In France they think of putting an end to the changing of the clocks, don’t know how I feel about this yet. Two of my H. macrophylla were given to me by a fellow garden blogger when I had just started blogging. The third H. macrophylla was given to me last year by my cousin. It came from my grandmother’s house, so I really hope I can keep it safe and (perhaps) even see it bloom freely one day. I’m beginning to add some other hydrangeas that bloom on old and new growth, but they’re not happy here yet. Looks like one of three survived the hot, drought-filled summer last year. Hope the clock adjustments will end up up suiting your nature. Apparently we al react differently to the tinkering of time. yes, they definitely don’t like hot and dry summers which we have too, so people tuck them in beds on north-facing walls, my best one is Ayesha which copes so much better with these conditions (Ayesha is Turkish, isn’t it? maybe that’s why) check it out, the flowers are so pretty, like lilac flowers. Just took some cuttings. Frilly it may be but the prettiness of spring is what we all appreciate. Despite the recent bout of horrible winter weather in the east, your garden is doing its part to move the seasons along. 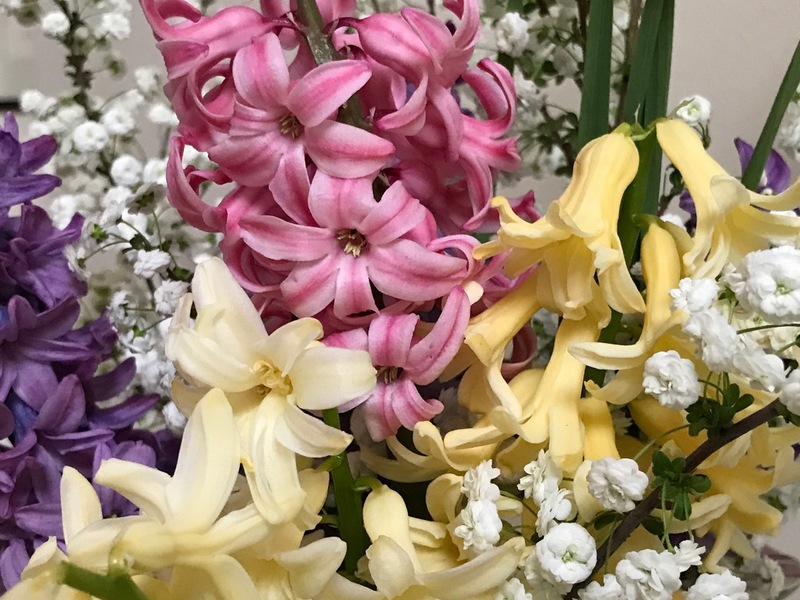 I love the Easter egg colors of the hyacinths and the frothy aspect of the Spiraea, another plant I wish I could grow. Thanks for the update on the flower submersion experiment too. I’m surprised spiraea doesn’t suit your environs–it’s pretty agressive here. Your have so much for choice though and I love the things you are able to grow. Gorgeous, the epitome of a early Spring bouquet in the Deep South. It has been awhile since I have seen any Bridal Wreath,it is lovely. Thanks. The spiraea is turning brown outdoors until an afternoon of snowfall. March roaring in per usual. I love the Spiraea Susie. It goes so nicely with the frothy Hyacinths. My larger hyacinths always lean at odd angles so if i catch them early enough they get cut. I never seem to have anything suitable to go with them in a vase though, so this year I will look out if my spiraea (an unnamed one) flowers around the same time. It’s a lovely combination! Thanks Cathy. I find hyacinths difficult to arrange in a vase. Their shape is not very flexible or forgiving but they’re still fun. Memories are powerful. Those pastels plus white remind me of Easter also. Love the Leucojum and ‘Bridalwreath’ Spirea.